LENCIA is designed to be sprayed and left on the surface where it will continue to act on bathroom grime mould and mildew. Spraying daily dissolves bathroom scum, calcium build-up and prevents mould forming. Can be used directly on baths, hand basins, ceramic tiles, toilets and urinals. By mixing with the water droplets after you use the shower or bath, LENCIA spreads out a layer of super wetting agents and mild plant acids that dissolve bathroom scum and calcium build-up. Natural non-toxic citrus and plant extracts (phytochemicals) kill mould and mildew spores as well as prevent regrowth. You will never have mould again when the shower or bath is cleaned daily with LENCIA. Because all natural based ingredients are used, LENCIA is safer than chlorinated, quaternary and other alkaline or acid based cleaners. Unlike chlorine it can't rust stainless steel or bleach your clothes or have toxic fumes. Many people try anything to remove scum and mildew. Bleaches, poisons, harsh abrasives and creme cleaners. They only work for a while. LENCIA works all the time without scrubbing or rinsing. Citrus Resources first introduced ZEST, a thickened washroom cleaner made from citrus extracts that could be diluted for maintenance cleaning. LENCIA goes one step further by introducing a super concentrate that may be sprayed at 1 to 10 for daily cleaning and mould removal. LENCIA may be sprayed with a foaming trigger spray rather than squirted onto the surface. Because it is non-toxic it doesn't irritate sensitive noses at this concentration. Hospitals can go back to foam trigger spraying with complete safety. Natural plant extracts that take the place of toxic mildewicides, bleaches and dangerous chemical disinfectants would appear to have an exciting future. 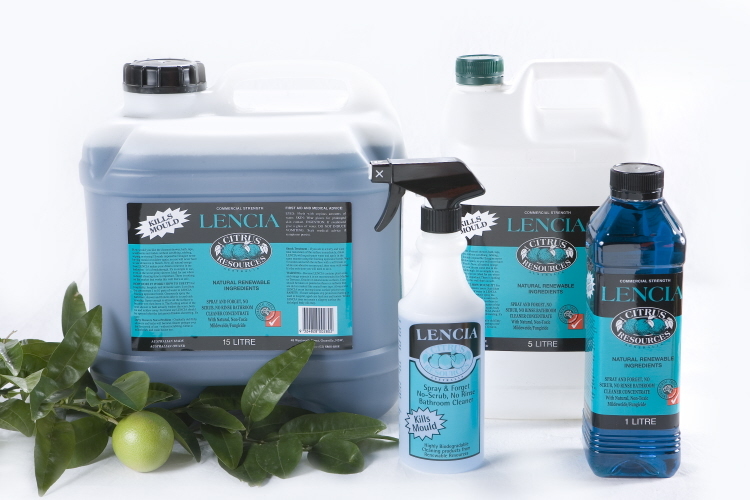 LENCIA is the world's first cleaning product to use non-toxic phytochemicals to kill mould, mildew and algae as well as to prevent regrowth. LENCIA's activity is "anti-microbial"; it kills the fungus that can cause athletes foot and tinea. The majority of mildewicides and disinfectants used in bathrooms are toxic and non-biodegradable. LENCIA is highly biodegradable, non toxic and can be safely used in septic systems. LENCIA exceeds Australian and tougher European biodegradability standards.